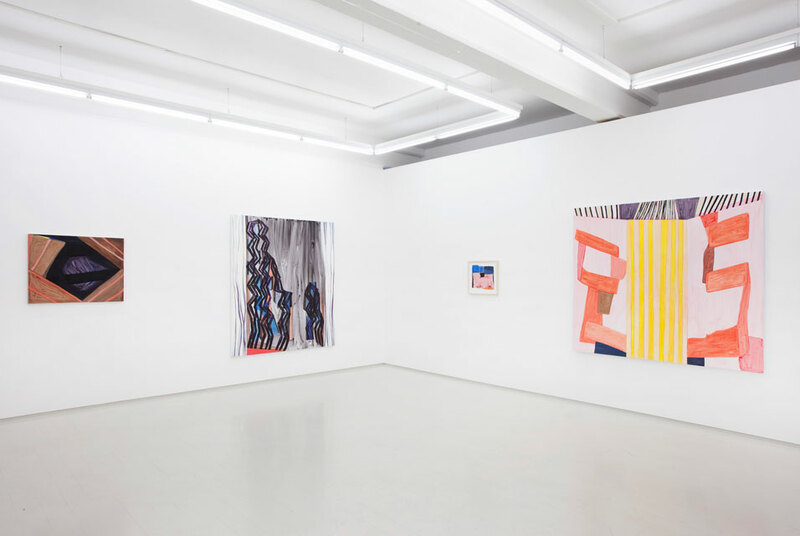 Julie Sass, All out, installation view. COPENHAGEN.- Julie Sass connects painting to texture (materiality) and the process of painting to establishing functions and relations within painting together with an investigation of how it relates to its surroundings. In the exhibition All Out, small and large scale works are combined with the intention of giving the images the possibility of large dynamic shifts in such a way that the viewer is able to engage with the work. At first glance, each piece contrasts with the next but at the same time, the different elements relate to each other within the group, such as loose paintwork, line placement or pictorial elements. The largest paintings in the exhibition can be seen as a sort of architecture put together within 'modules', where if you took an element away, it would lose its balance. As a whole, they suggest a sense of a moveable aesthetic experience. Julie Sass works with layers upon layers of varying transparent washes, where different materials such as vinyl, colouring pencils and different acrylic media cause the paintings to appear at many different levels. The paintings impart different senses of light, ranging from light to almost black. The darkest work is built up of small artistic signature-like strokes characteristic of Julie, though such dark a painting has not appeared before in her work. All the paintings are worked on in a state of immediacy or flux and therefore give the impression of looking almost as if they are built, rather than painted. As critic and poet Barry Schwabsky puts it in his text Some Objects in the small artist book, JS (2012), Julie Sass creates works of and about the ordinary, but not as seen in a general fashion. Her works aim to provoke thought without imparting knowledge. She forwards thoughts on the aesthetic experience while simultaneously investigating it. In this she searches for the artistic method and the meaning of same. Julie Sass lives and works in Copenhagen and has studied visual art at the Danish Royal Art Academy in Copenhagen and at New York University in NYC (MFA) where she specialized in painting. Since receiving her MA in Theory & Mediation from the Royal Danish Academy, Copenhagen, she has been behind several exhibition initiatives and is the curator of the exhibitions Painting: The Current Surprise as well as Painting: A Way of Thinking, both of which dealt with the new focus on abstraction in its diverse forms. She took part in the exhibition Til Vægs at Charlottenborg kunsthal, Copenhagen and ENTER II at Kunsthallen, Brandts. She has exhibited in Sweden, Denmark, Canada and the United States. She is represented at Statens Konstråd (SE) and several private collections. Recently she has initiated, and curated (with Milena Høgsberg) the ambitious project Shaped by Time (contemporary art embedded in pre-history) at the National Museum of Denmark, Copenhagen.